Tate Publishing, 2014. 36 pages. 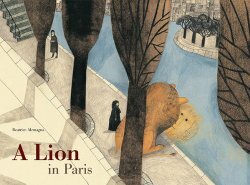 This oversized picture book is a treat for anyone who loves Paris. When I say oversized? I mean enormous. Looking at this book is an event. The cover opens upward (with the spine on top, horizontal), and you see the lion's paws unfolding a map of Paris, which will trace his route. A few sentences show on the plain page on top, while the page in your lap has a large picture with photos of faces and other details inserted in the drawings. He was a big lion. A young, curious and lonely lion. He was bored at home on the grasslands, and so one day he set off to find a job, love and a future. The lion begins his journey around Paris at the train station, the Gare de Lyon, and from there we get a wonderful tour of Paris, from a lion's eye view. The lion's heart was beating very fast as he continued his long walk. At the top of an endless flight of steps he saw a white castle. "It looks like a cream cake, doesn't it?" said an old lady, smiling at him. "Grrr," replied the lion. They went back down all the steps together. At the end of the book, the lion finds a permanent place where he is happy. The lion in this story was inspired by the statue of a lion in the Place Denfert-Rochereau in Paris. It was erected by the architect Frédéric Auguste Bartholdi between 1876 and 1880. I wondered why the Parisians are so fond of this lion. I think it is because he looks very happy where he is. And who can blame the lion? I know I have been happy when in Paris. This book brings some of that joy back.